Situé sur Aylen Lake, près du parc Algonquin, ce gîte de charme est l'endroit parfait pour les vacances. Aylen lac est connu pour être un grand lac alimenté par ressort naturel qui offre la pêche et les sports nautiques fantastiques, aussi connu comme l'un des lacs les plus propres en Amérique du Nord. Levers et couchers de soleil sensationnels! Cette propriété de 13 chalet spacieux, idéal pour les grandes familles ou petits groupes. Cuisine, salle à manger, salle familiale, loft supérieure ouverte, salle de bains, et cinq chambres. Un chalet rustique qui dort 6 est également disponible sur la propriété pour un montant supplémentaire de 300 $. Notre galets et de rochers rivage dispose de 2 quais de seize pieds pour garer votre bateau, nager à partir de, ou tenter votre chance à la pêche, et deux grandes terrasses pour prendre le soleil et pique-niques. Mobilier de salle à manger à l'extérieur et BBQ au propane disponibles. Vous trouverez deux plages publiques de sable (en bateau sur le rivage) avec des installations de pique-nique, et de nombreux sentiers sur le magnifique lac Aylen. À proximité du parc Algonquin offre une grande randonnée, le vélo et sentiers de VTT, observation de la faune, et bien plus encore. Voyage opportunités journée comprennent Centre Musée des visiteurs, le musée Logging, et d'autres attractions touristiques dans le parc. Rafting, kayak et le golf au golf locaux. Se il vous plaît contactez-parole de la disponibilité et les détails de la location. Our family had a great time at your cottage. We have a range of ages in the family and there was something for everyone. Fun time for all and the kids have already asked if we are going to return next year. The cottage dynamics suited us, the lake was clean and beautiful and the scenery was awesome. We will be back. My brother and his family stayed at this cottage recently. My family and my two sisters had rented elsewhere on the lake. The cottage is huge and solid. Plenty of room for a couple of families. Was not the cleanest when they arrived and my sister in law spent a good deal of time bringing it up to acceptable. Furnishings and decor are rustic and the usual hodgepodge of timeworn stuff. This is not a "Cottage Life" showcase. However, the location is good, it is spacious, the beds are adequate, the bathroom works and has hot water plus the porta-potty outhouse outside, the balcony and two large docks offer plenty of seating. BBQ worked fine. Aylen Lake is beautiful and as noted the owners or caretaker has laid patio stones out in the water as a walkway to the sandier part of the lake bottom. Large table for family meals or games, good complete kitchen, etc. It's not a romantic hideaway or showcase, but it is adequate housing on a beautiful lake where you should be outside most of the time. Thank you Paul, for your review. We updated our cottage décor in 2016. We try and update every few years but not always possible. Our cottage is well maintained and we have spoken with our cleaning agent about your complaint and apologize. Hopefully our renters will find it up to their expectations! This large cottage (5 bedrooms plus loft) easily accommodated our group of 9, including three children (10, 11, and 14). It is rustic, so don't expect luxury - but is an "authentic" Canadian cottage experience in my opinion. Aylen Lake is very clean and cool - excellent swimming. The owners have even installed rock steps and patio stones to make entry easier. Nice canoeing to nearby islands (bring your own - no boat provided). Loons, beaver, chipmunks, red squirrels, bluejays and other wildlife abound. Cottage is well laid out, and adequately equipped. Kitchen features full stove, fridge, microwave, and electric griddle. Lots of seating in living/dining areas. Older TV with VCR/DVD combo player. Quiet neighbours and low traffic lake. 25 minutes to Barry's Bay, and close enough to Algonquin Park to make it a base for day trips along Hwy 60. Easy drive from Ottawa, longer from GTA. Owners easy to deal with, although some information lacking (VRBO issue?). All in all, I would recommend this cottage and return myself. Adventurers - good base for nearby explorations in Algonquin, white water rafting on Madawaska, other provincial parks. Families - lots of room for everyone, teens can find their own space. Girls (or guys) getaway - again, lots of room, one bath may be limiting in this case. Sightseers - near several provincial parks and other points of interest. Thank you for your review Andrew, we would love to have your group back! We try to provide a very nice vacation site! So my group which consisted of a total 13 people arrived here for the May long weekend in Friday around noon. We already knew from pictures that the outside yard is not well maintained but when we got inside, the house with a quick look, looked okay but later we found so many bugs around the house on the floor, sofa, even on some dishes. This really annoyed everyone in the group because we obviously didn't want this. Upon arrival, the BBQ was also not working, apparently rats had chewed up the pipe from the propane tank. To resolve this, we had the agent bring us his bbq as most of our food needed to be bbq'd so we weren't going to do way without it. Overall, this property is not worth the stay, the lake view is good but that's about it. The lawn area not being properly maintained or paved was actually a lot more annoying than we had thought it would be. Also, another huge no no for us was the fact that there was only one washroom in the cottage. There was a porta potty outside but obviously you can't shower in there. 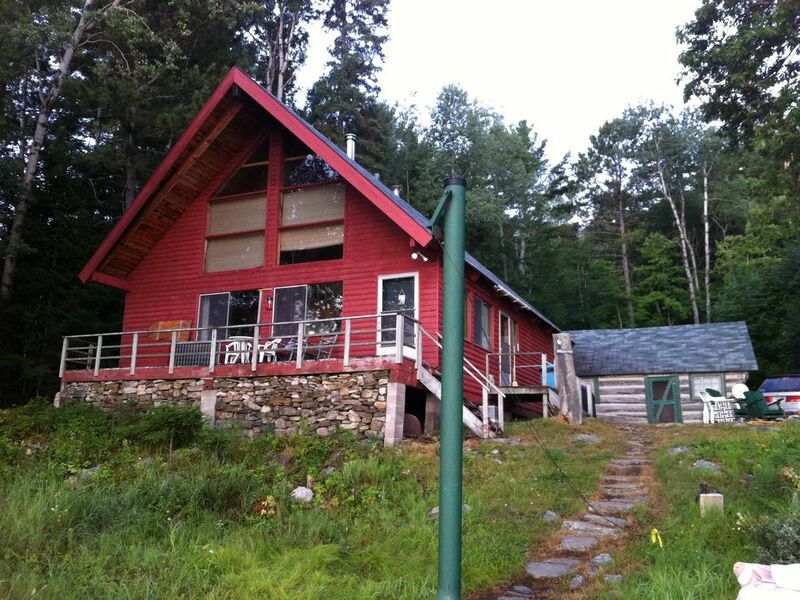 You can find much better cottages for around the same price, avoid this one if you can. I am very upset by this review. This was a group of loud unruly college age kids. They disturbed our neighbors and frightened one of them. They were loud and left the property scattered with beer bottles and trash. Our agent was in to reprimand them multiple times during a 2 day stay. They brought a hooka into the cottage and burned holes in our carpet. We did not and do not have a bug problem at our cottage.Our BBQ grill was not working, which we were unaware of, and our agent kindly brought his personal grill in for them to use.We made it clear to them that they would not be allowed back at our property. Due to their bad behavior we had to change our rental policies. It is true that we only have one inside bathroom, but this is noted on our site. We expect you to leave the cottage cleaned, as found, Clean kitchen, bathroom and vacuum cottage. If not clean, fee of $130. will be taken from deposit. Also there is a $300 fee for my log cabin. Weekends are available $300 a night May, June and September.